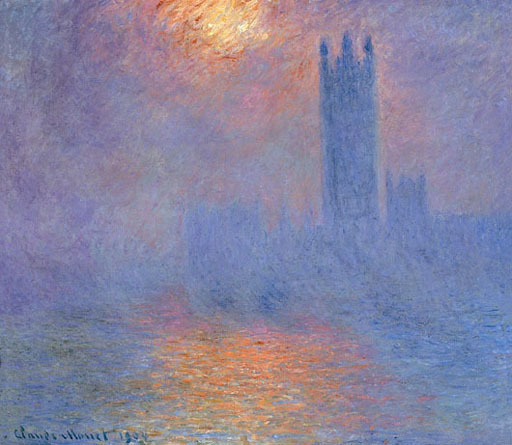 Impressionist leader Claude Monet completed the Houses of Parliament as a series of paintings intended to study the monument at different times of day. Monet and his family were in London, seeking refuge from the Franco-Prussian war which had engulfed much of France. 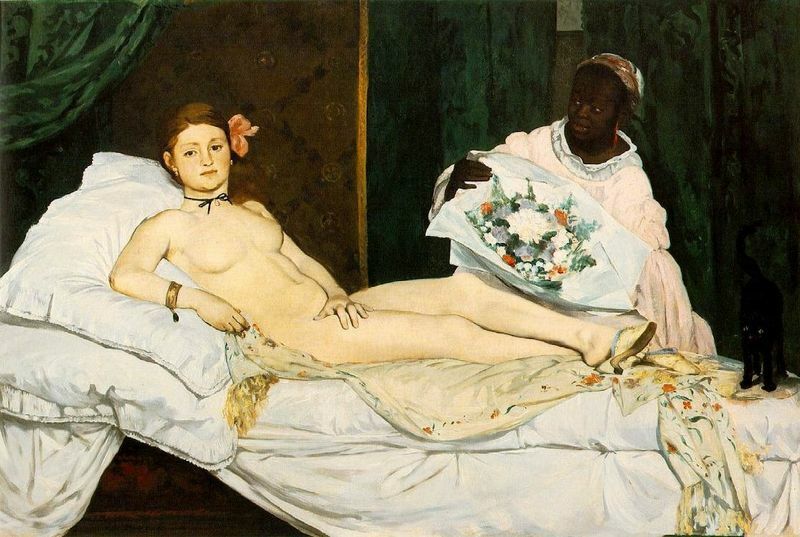 The painting shows an early turn to series painting, a form which Monet heavily favored towards the end of his career. Monet's love of London was clear from his dedication to the river Thames and his study encompassed a great deal of works of the river. In addition to this, Monet came into contact with a number of high profile Realist artists who were his friends and had a great deal of influence in equal measure. 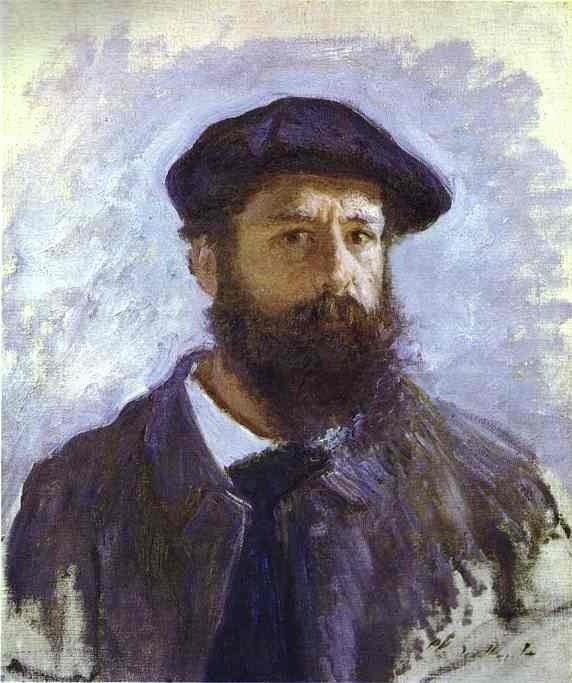 Monet was 30 when he moved to England with his family to protect them from the raging war between France and Prussia from 1870-1871. 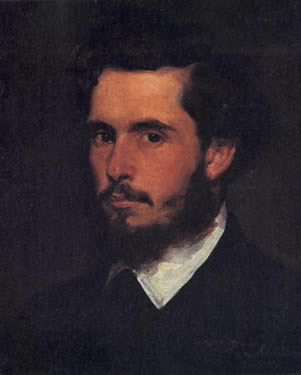 Claude Monet's first-born son, Jean was only two when Monet made the decision to move his young family from harm's way. In the few years Monet was there, he painted some of his most picturesque work and befriended some of the legends from the Realist era. Their style clearly had an impact on Monet and he heavily relied on their guidance in a country he knew little about. 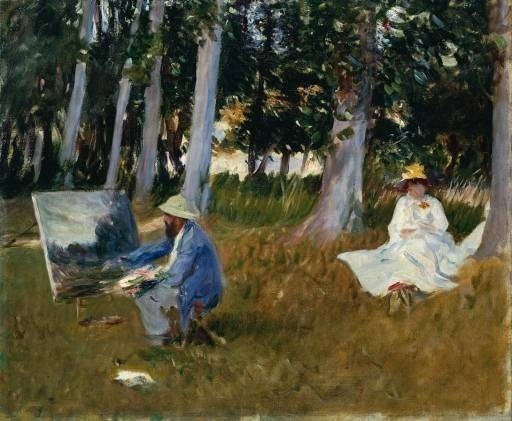 Monet's principle advisors and friends were ex pat Americans, John Singer Sargent and James McNeill Whistler and both acted as his translators and guides. Monet's efforts to paint in London were said to have constantly hampered by bad weather and constantly changing conditions. Known for its fog during the winter, Monet specifically painted the Thames at this time of day in order to depict its weather effects in full magnanimous detail. Monet once famously said about London that: "Without fog, London would not be a beautiful city. It is the fog that gives it its magnificent breadth". The inspirational view for many of Monet's pieces is said to have been from the sixth floor of the Savoy hotel, from which he was able to depict many of the Thames landmark structures. In addition to the Houses of Parliament, Monet was able to paint Waterloo Bridge and Charing Cross Bridge. Due to his shortened stay in London modern day critics believe that he finished his works away from the motif at a later date. It's though that Monet perfected these works back in Paris and regularly asked for photographs from London in order to facilitate this. The purpose of Monet's pieces was to accurately depict the change in look of a static object in relation to drastic weather conditions. For such a purpose the Houses of Parliament serve as a perfect backdrop. In his series the building is a static darkened structure that changes in appearance, in fog or sunlight. After the Houses of Parliament Monet painted a multitude of similar works that depicted similar scenes at different times of day. Such works are all appropriately titled to reflect what Monet was painting. Monet was a renowned fan of Japanese artwork and the immense collection, which currently resides in his Giverny home, is testament to this. Monet was said to have come across his first Japanese wood block print at a notably early age and such exposure influenced Monet a great deal and subsequently the Impressionist movement as a whole. Monet drew inspiration from the greats of Japanese art. Namely Utagawa Hiroshige, Katsushika Hokusai and Kitagawa Utamaro. 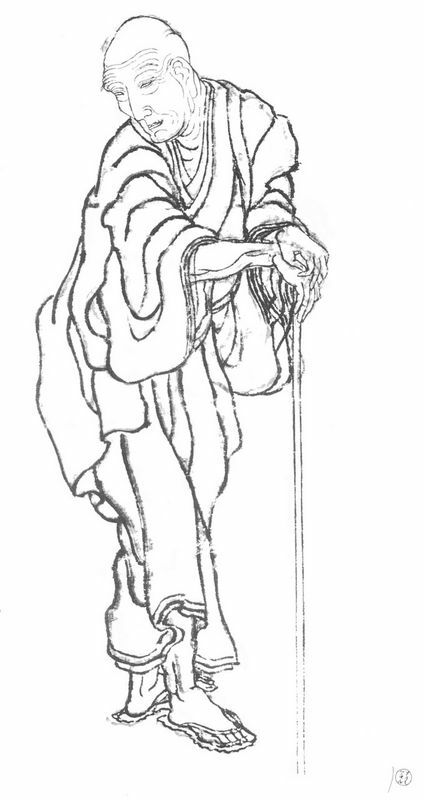 The Japanese style of art was a focus on the ideals of emptiness. 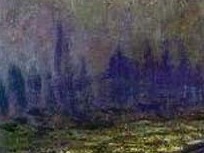 Monet's attempt at a loss of perspective through his art is a style he no doubt adopted from the Japanese style of art. This aspect of Japanese art was clearly the only part that Monet took a noticeable interest in however, as his works differ broadly in terms of subject and form. Claude Monet only visited London a handful of times but it clearly made a distinct impression on him. In the year he was there he sought to study and depict much of the Thames River that ran through the heart of the city. As an artist dedicated to depicting different weather conditions in scenes, Monet's interest in London was an obvious one. From his viewpoint in the Savoy hotel, he was said to have been able to see a great deal of the Thames' iconic monuments. In the late 19th century many cities in England, particularly London, had become renowned for its distinctive blanket of fog. Such a feature, known as pea soup fog, was the cause of coal fires in the city. The effect was made even more popular by its inclusion in stories of famous fictional detective Sherlock Holmes. Houses of Parliament is one painting in a series which sought to depict the effect of various weather conditions on a famously recognizable monument. Monet was known throughout his career for his extensive range of colors. Whilst many artists seemed to have a limited range, Monet was able to depict bright and dark colors in equal magnificence. His work on The House of Parliament is a perfect example of the artists range. The yellows and gold of the breaking sun are in perfect contrast of each other and Monet further highlights this by making the rest of the portrait a combination of both colors. The sky in the scene is a perfect blend of the golden light of the sky mixed with the dark grays of tumultuous clouds. Monet's use of color in this regard is even more vibrant because the colors in the remainder of the scene seem directly linked to either the static natural object of the sun or the man made static object of the Houses of Parliament itself. The clouds closer to the incomplete image of the sun at the top of the painting are brighter, whilst the clouds closer to the jet black structure of the government building seem darker in comparison. The Houses of Parliament are having just as big an effect on color and lighting as the natural onset of the sun is. The light effects of both the top and bottom of the painting further highlight the intensity of the shades of black on the building in-between. 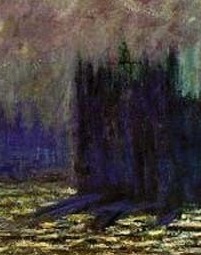 As with all of Monet's works the use of lightning is fundamental to his style. In this scene the source of light is the breaking sun at the top of the picture. It is the brightest spot in the painting and the work is primarily a depiction of the effect of that ray of light on everything it comes into contact with. Monet's Impressionist study of light is one that affects all facets of his work. In this respect the Houses of Parliament is his primary object for this study of light. The beam of sunlight from the top of painting strikes the left side of the building and continues on to distort the solid object. The effect continues right down to the buildings shadow in the water. Monet's exquisite use of Impressionist style brush stroke is in wondrous display in his depiction of the Thames and the lights effect on the water's surface. 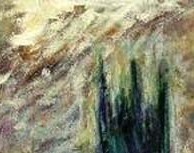 Monet uses rapid horizontal brush strokes in order to portray most of the water but when it comes into contact with the vertical shadow of the Houses of Parliament his brush stroke changes drastically. As the sun strikes the left and right side of the building, the shadows reflection on the water changes its form. Monet's technical use of brush stroke depicts this effect in realistic detail. Claude Monet spent much of his professional career in various areas of France but was said to be heavily influenced by the work of artists abroad, namely Japanese artists and a cadre of ex-patriot Americans who were living and plying their craft in England. Monet completed a total of four works in this series and considering they were his first major project away from his native France they were well-received by the public upon his return. Monet's work maintained his reputation as a forerunner of Impressionism as he went on to continue his series work on a much larger scale which would eventually garner him national reverence at the end of his career. As a devout follower of the 'en plein air' style of art Claude Monet marketed his pieces as such. 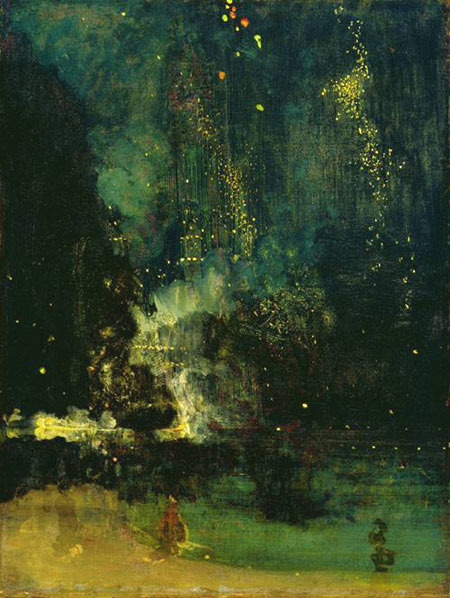 Many modern day critics such as Virginia Spate have collated evidence which suggests many of his works may have been finished months or years later away from the motif. It has also been noted that like other Realist painters such as Courbet, Monet had readily began to embrace the new medium of photography. Paintings of the Houses of Parliament that he was unable to finish in front of the motif 'en plein air' he finished from photographs. Monet repeatedly requested such photographs to be sent to his location in France. Houses of Parliament currently resides in the Musée d'Orsay, Paris. 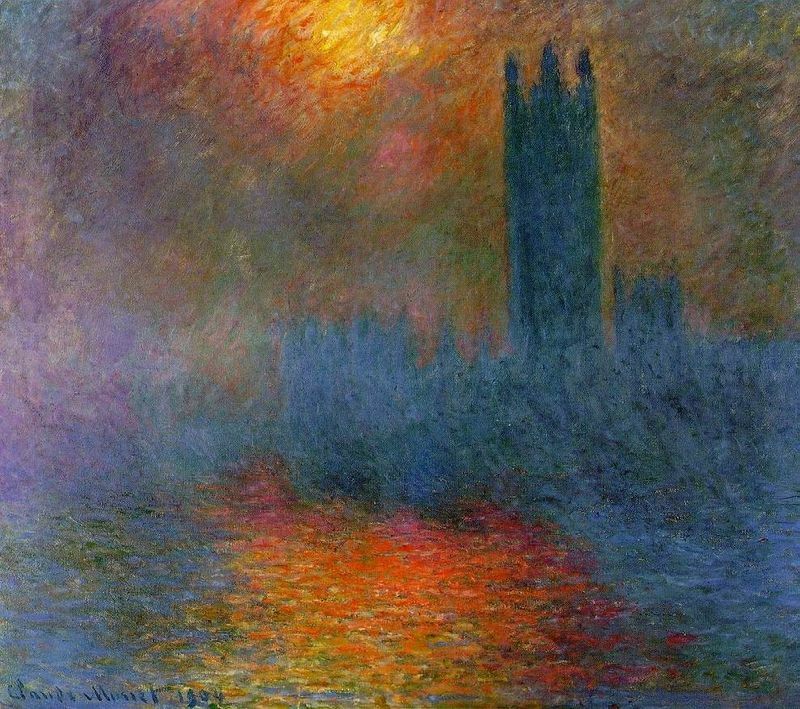 Claude Monet was 31 years old when he painted Houses of Parliament. Unlike much of his work its creation was a result of circumstance as opposed to pre-planned design. Monet painted Houses of Parliament whilst escaping from the Franco-Prussian war that had ravaged much of France at the time. His brief stay in England with his family resulted in an extensive study of the Thames River and a series of paintings, the subject of which was the seat of power in England. When Claude Monet completed Houses of Parliament Impressionism was gradually becoming the accepted mainstream art movement of the time. Realism had spelled the end of Romanticism and while the two movements differed broadly, Impressionism differed to some degree from Realism. Houses of Parliament is a depiction of an ordinary scene from day-to-day life but its focus on light effects and the time of day make it a very specific branch of Realism that ignores its other rules of realistic and detailed depictions of objects and people. 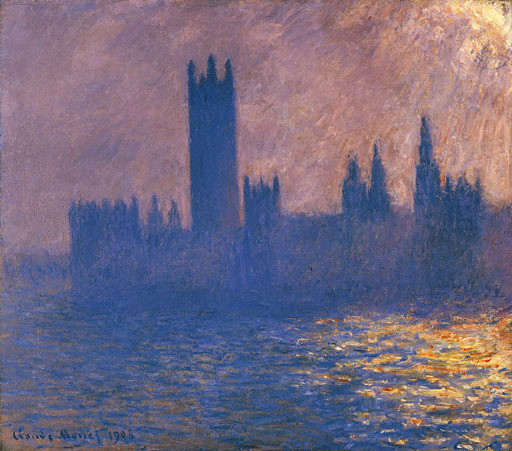 In Monet's Houses of Parliament the buildings are vague black shadows in the background and as opposed to Realism, this gives the work an almost supernatural feel.